I want to share with you all a sweet story that happened 5 years ago. I was pregnant with Thaara, then I suddenly started craving for strawberries a lot. At that time, it was not at all available in any store in Coimbatore.I know it was rare to get(I have had it once or twice only before that) but not that none of them will have it. Dad had inquired in almost all the shops there. The only response was if we get stock will let you know. I was so disappointed, you all know right, how a pregnant woman feels when she wants something to eat and didn't get it. Then one day my brother surprised me with a box of strawberries. My brother had asked his friend from Ooty to get it,(since it was available there at that time) and send it across. I was so delighted to get it, like I won a lottery. I was really touched that my little brother got me what I wanted to make me happy. So thoughtful of him!! So whenever I see strawberries, I always think about this. Thaara loves strawberries a lot. In whatever form I give her, she is ready to have it. Now you all know what this is all about. Yes!! A recipe with strawberries.. 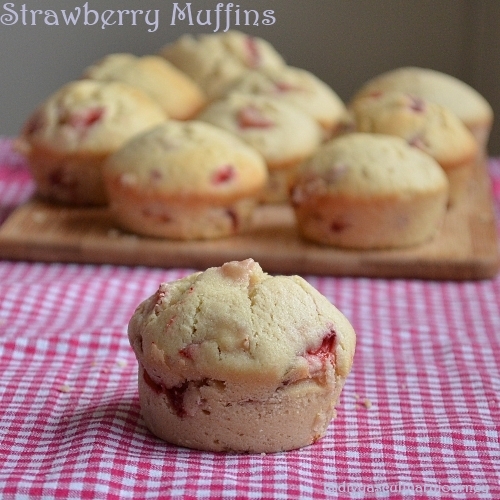 Strawberry Muffins..
As I was browsing for recipes for Strawberry Muffins, I came across this recipe from, Butter Yum . I tried this and the result was awesome. 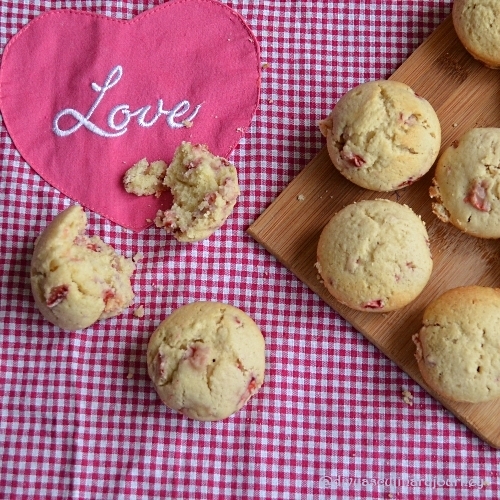 A wonderful, soft and moist muffins. In a bowl, sift together all purpose flour, salt and baking powder and keep it aside. In another bowl cream butter and sugar together and beat in eggs, one at a time and add vanilla extract and mix well. Then add this mixture little by little to the flour alternating with milk and keep mixing till you get a homogeneous mixture. But take care not to over mix the batter. Finally fold in the strawberries. Prepare the muffin pan by greasing and flouring it. Or you can simply use muffin liner. Then pour in the batter in the prepared pan and bake at 375 F for 25- 30 min till the tooth pick inserted comes out clean. Then let it cool and enjoy. 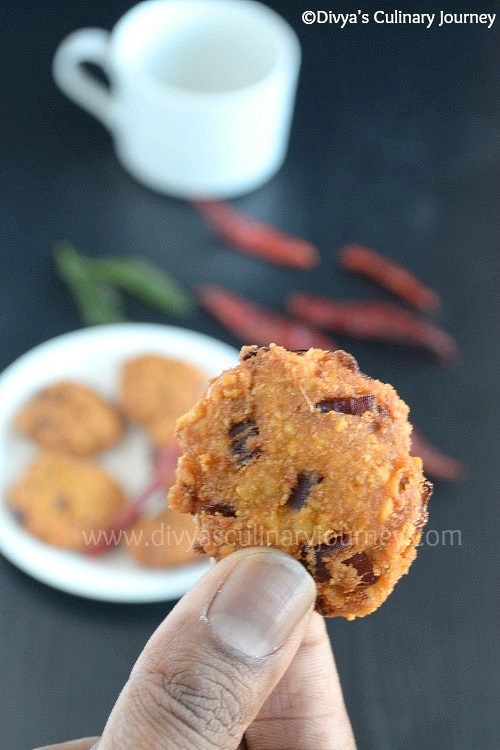 When I think of " Vadai", this type of vadai only comes to my mind. I am talking about "Masal Vadai". 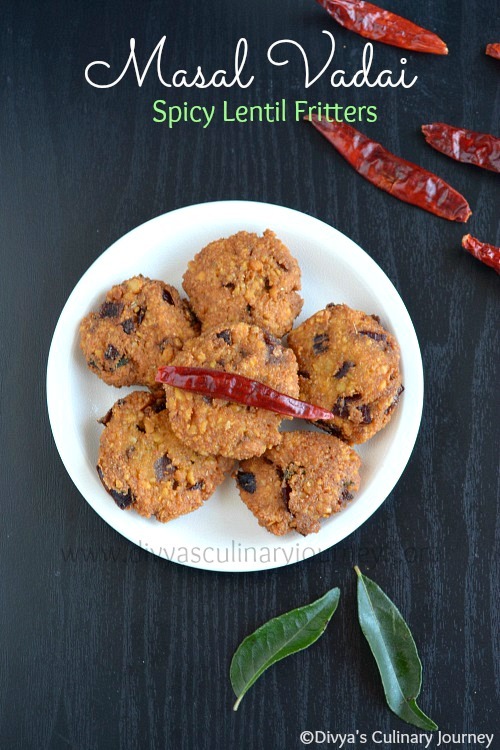 I am really fond of this vadai and when we were in Chennai, hubby used to get it from a "paati" who used to make it roadside near the house. Every weekend, he would go get a parcel and come. Still I remember the taste of those vadas- Spicy, tasty and crunchy. Miss that paati's vadais . 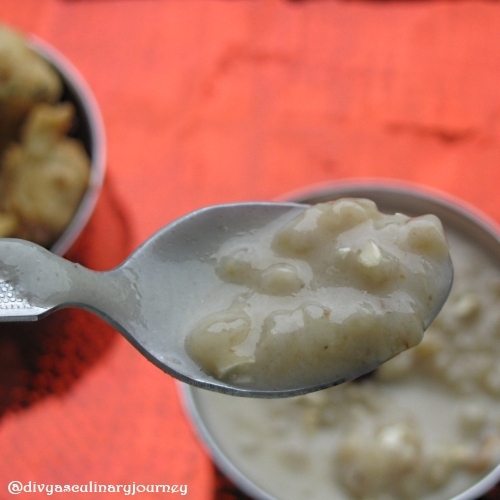 Now I have started making my own vadais , though I get compliment from Hubby still he prefers Urad dhal fritters more. But I shy away from making them because i never get that perfect dough nut shape. That is another story. 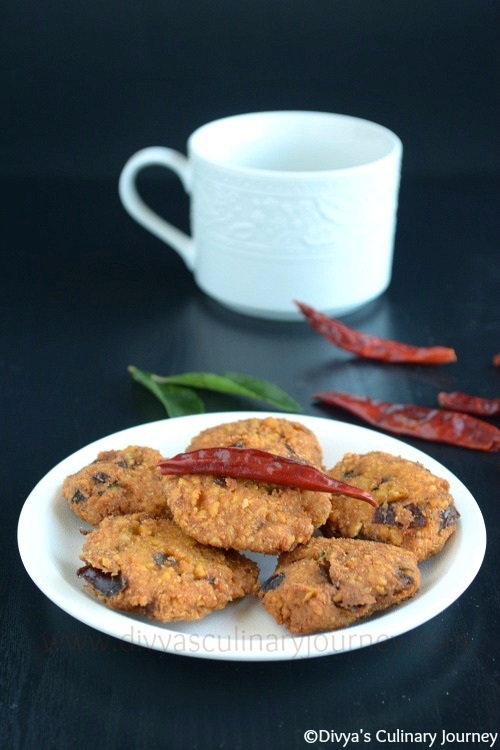 For any festival or just for a snack, this spicy lentil fritters are really great, just warms up your mood. Dried Red chillies, 2- 3 nos. Soak channa dhal for atleast an hour. Then grind the soaked dhal with fennel seeds, red chillies, garlic, and ginger into a coarse paste. Then transfer the ground dhal mixture into a bowl and add sliced onions, curry leaves, a pinch of asafoetida and salt and mix them till they are fully incorporated. In a skillet, heat oil and shape the mixture as patties and deep fry them in batches. Once they start turning golden brown, remove them from oil, drain them on paper towels and Serve them hot. It's summer here and the temperature is almost nearing 100 F everyday. 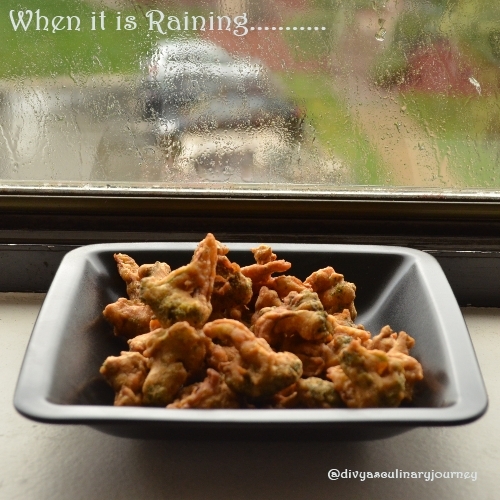 In a weather like this, I hate to stand near the stove and deep fry anything. May be could just sit down and have something cold and light. But yesterday evening, there was some rain and temperature came down a little. 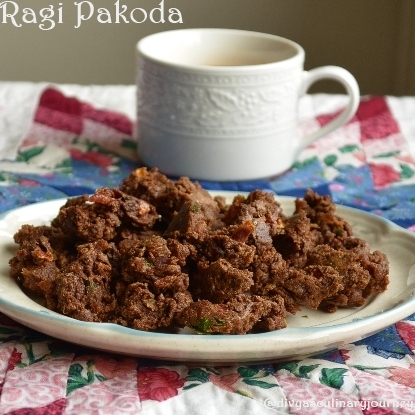 Hubby was at home and demanded a evening snack, so made this ragi pakoda. 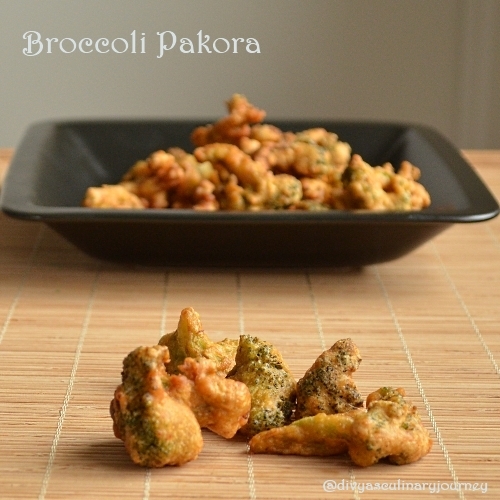 The one thing about pakodas I like the most is no pre -planning involved. If you want to make it, just cut up the onions, mix up all the ingredients, deep fry it and serve. In a bowl combine flour, turmeric powder and chilli powder, salt and to this mix onions, grated ginger, curry leaves and chopped cilantro. Add water little by little and keep kneading till they are incorporated well. Then add butter to this and mix well. In a skillet, heat enough oil to deep fry. Then deep fry the pakodas in batches. Remove them from oil, drain them in paper towel and serve them with a cup of tea. While adding water while kneading, take care to add right amount of water, too excess will make the pakoda soggy and too little will make it tough. 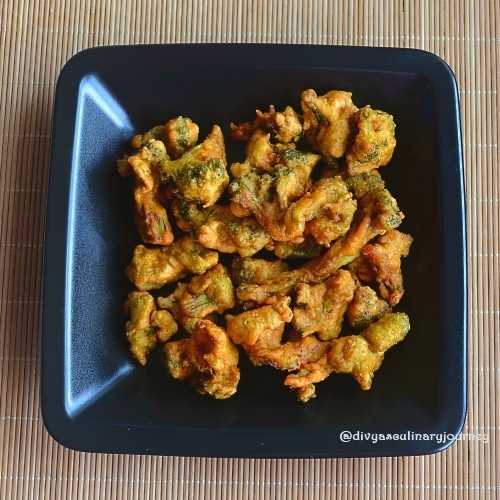 Also while deep frying, don't over crowd the pakodas. Then they won't be crisp. 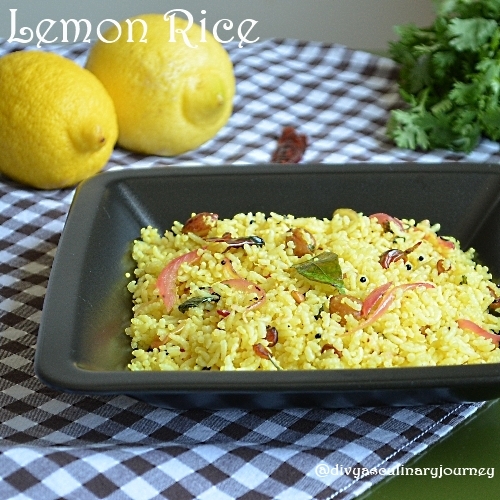 At every south Indian home, Lemon Rice is a very familiar dish. There are some people who like the dish and some people don't like it at all. I fall in the first category. When I was in college, Mom used to pack this for lunch and I will finish the whole box without leaving anything.You may think just a Lemon Rice, what is special about it? 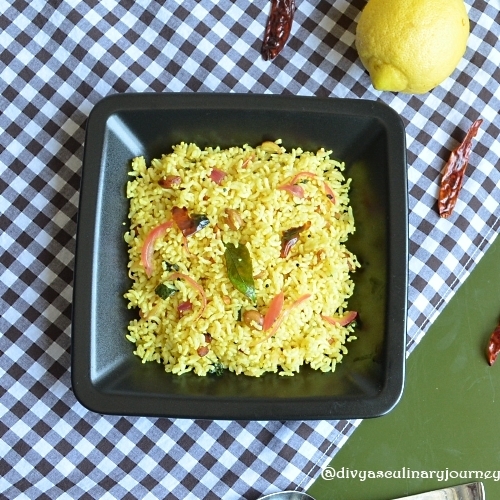 I really love the attractive color of the rice, its tangy flavor and the most beautiful thing in the rice is how the onions turn pink and translucent in it. And also since I started cooking,I make it almost once every week since it is very easy to make and also can be made quickly. Also it is great for packing food for picnics and even lunch boxes. What are the ingredients needed?? In a skillet, heat oil add mustard seeds. Once they sputter, add channa dhal, peanuts and roast them till they turn golden brown. Then add turmeric powder and mix well. Finally add the lemon juice and salt and switch off the stove. Now add rice and mix well. When you think of summer, the fruit that first comes to your mind is Mango. Everywhere there are recipes with Mango and I too wanted to post one.But was waiting for the right time. So I made a salad with mango and strawberry with orange honey dressing. 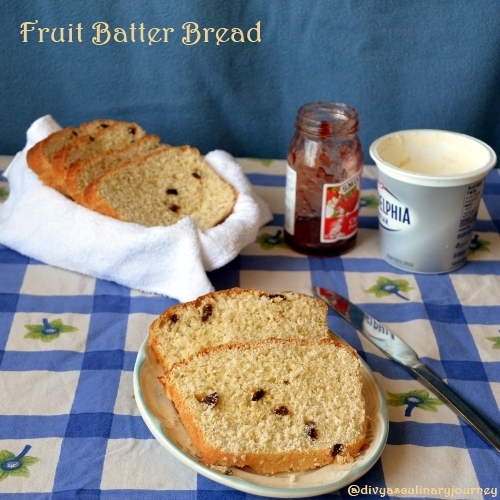 It was very refreshing and is perfect to have as a snack or even as a healthy dessert. Hull the strawberries and slice them. Prepare the dressing by mixing orange juice, honey and mint leaves together. 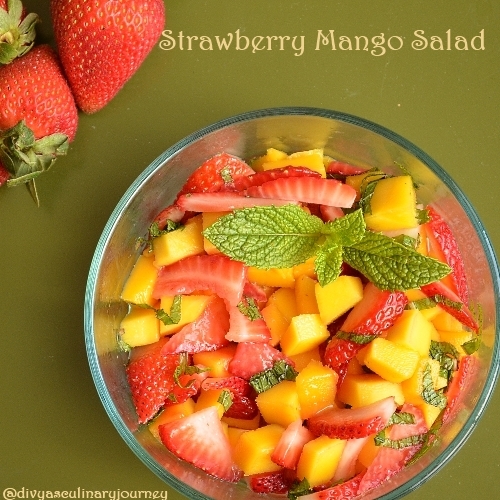 Toss in mango strawberry along with the dressing. Refrigerate them and serve them. I was not a fan of salad before. Never in million years thought I will make salad at home. 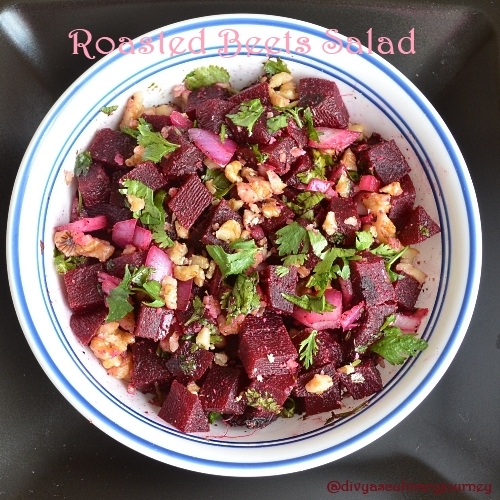 But when hubby and daughter started showing interest in Salads, I was left with no options, except making them at home. Still am far away from making all those leafy salads, which may be I will try sometime (when they demand, may be). Recently we have announced Wednesday as "No Rice Day!" at home. So every Wednesday I have started making some kind of salad. 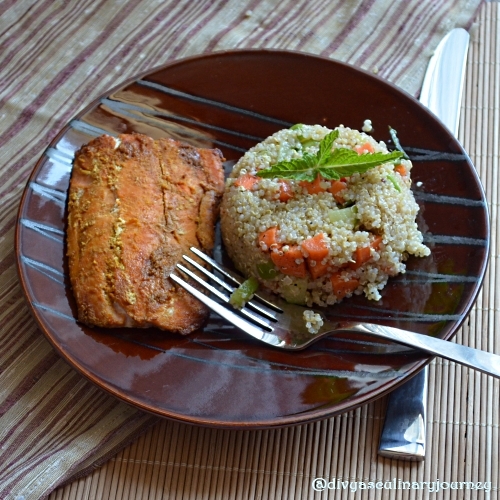 Last week made this Quinoa Carrot Cucumber Salad for lunch along with baked Fish. I must say it was good and got nice remarks from hubby and daughter. Quinoa as you all know, is very healthy - rich in protein and high in dietary fibre, quinoa is digested slowly, making it a good low Glycemic index diet. If interested to know more about Nutrition Secrets, click here. Prepare salad dressing by mixing lemon juice, olive oil, salt, pepper powder and mint leaves. 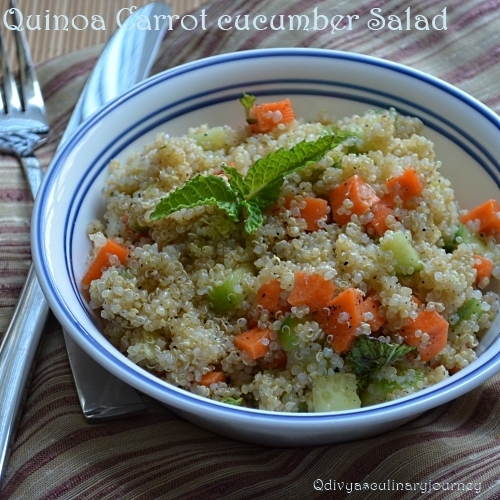 Mix the cooked Quinoa, carrot and cucumber. Then Toss it with the salad dressing. Garnish with a mint leaves and it is ready to serve. Quinoa has a bitter outer coating and has to be washed away before cooking. Most of the boxed quinoa, recommends a rinsing before cooking too. 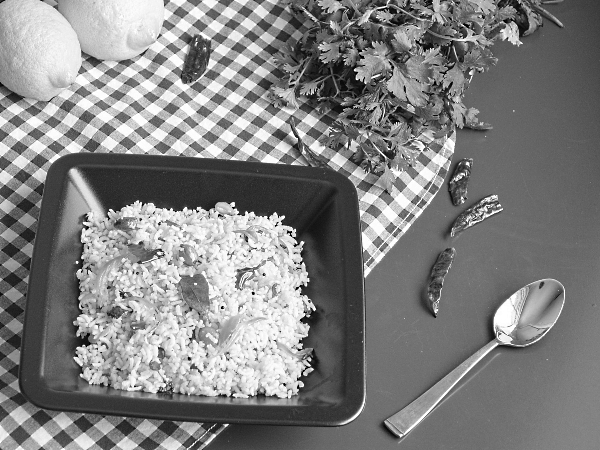 Quinoa can be cooked the same way as rice. I pressure cooked it. The cooked grain has a tiny curl and it will have slight bite to it. 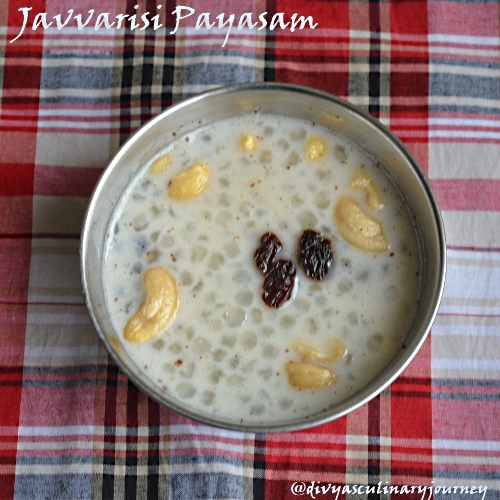 Today's recipe is Javvarisi payasam. I am posting the microwave version today. 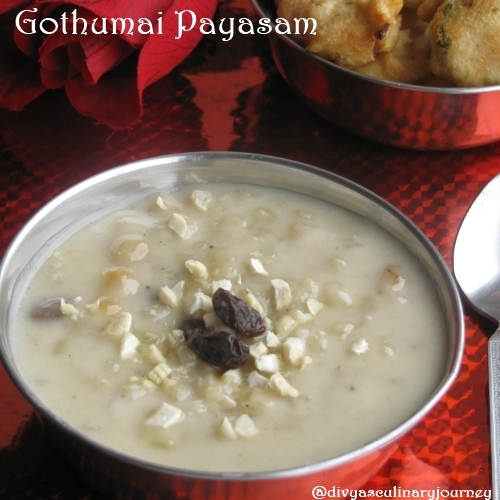 It is simple and easy to make payasam. Few days back one of my neighbor had made this payasam for her wedding anniversary and brought it home. It brought back a lot of childhood memories. It has been years since I had this payasam last. So I definitely wanted to try this payasam. I tried making this for my son's star birthday, the sago took forever to cook and sugar was very low. Then yesterday I soaked it for sometime and cooked sago and dessert came out good, but it was little burnt in the bottom, I still took a little and saved for the picture and rest gave it to everyone at home. Today morning I was looking for the payasam to take picture at home. I could not find it at all. I could not figure what happened to it. Later when Hubby called I asked him about the payasam, he laughed merrily and told me since he had to work late night yesterday he finished it off in the night itself. So today again had to make some for posting. I decided to try making it in the microwave. Soak Sago for 30 minutes. Then drain the excess water and wash away the starch in it. Then in a microwave safe bowl, add 1.5 cups of water and add the soaked sago and cook it for 15 minutes. In a equal intervals take the bowl out and stir and keep inside. Check the consistency. Once the sago turns transparent, its done. Then add the sugar, milk and condensed milk and mix well. Then microwave for 3 minutes. Powder the cardamom with sugar and mix with this and microwave for 2 minutes. Mix ghee with raisins and cashew and microwave for 30 seconds, toss them well and again microwave for 30 minutes, they will be roasted. Add this to the payasam.Mix and it is ready to serve. 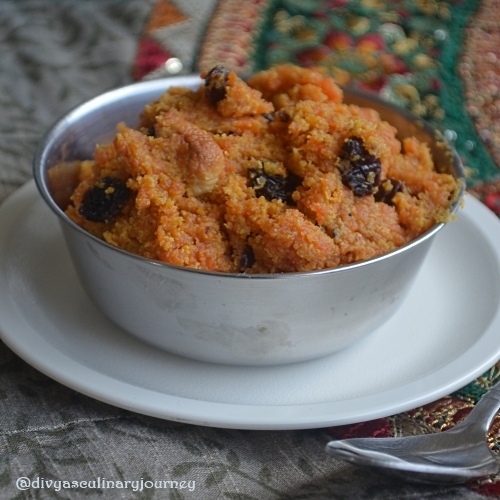 Carrot Halwa needs no introduction at all. It is a rich dessert made with carrots and loaded with nuts and raisins. I made carrot halwa for my daughter. She is a big fan of carrots, almost to the doubt that she was a bunny in her last birth. Last week, She got full marks in her kumon math and had moved to next level. She has just started going to kumon and has moved from 4 A to 3 A. She was so happy and excited about that, so we wanted to celebrate . Celebrations call for something sweet always, right? 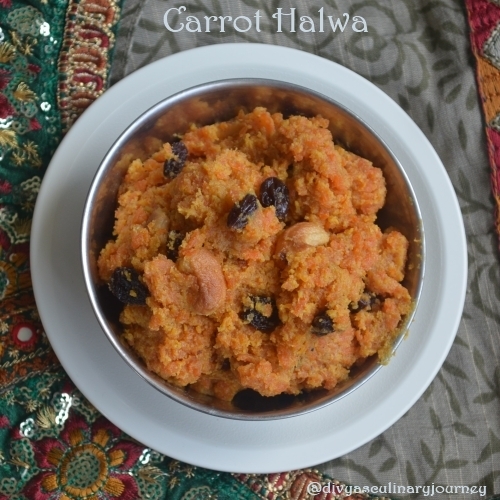 So made this Halwa with her favorite carrot. Powder the cardamom with 1-2 Tbs of Sugar. In a Tbs of ghee, and roast raisins and cashews. In a sauce pan, add the grated carrots and milk,let them cook. Once the carrot turns soft and milk starts evaporating, then add the condensed milk and sugar. Mix well. Then in equal intervals keep stirring and wait till all the liquid evaporates and the mixture comes to halwa consistency. Then add the powdered cardamom and mix well and remove from stove. Finally add the roasted cashew and raisins along with ghee and mix well and serve. It can either be served warm or chilled. Sometimes it can be served warm with vanilla ice cream too. But I personally prefer it served chill and how about you? I made this payasam for my son's first birthday(that was a month ago) but still didn't post the recipe waiting for the right time. 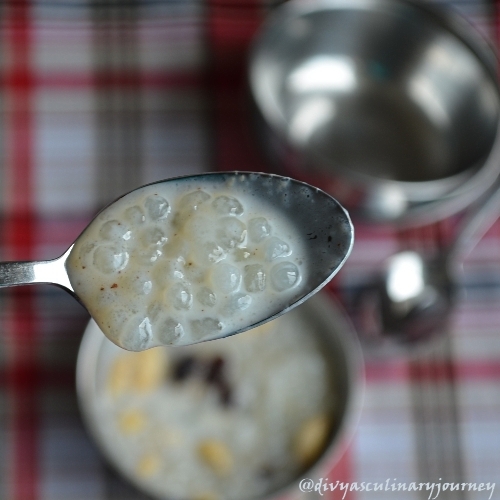 How I ended up making this payasam is a big story. I had bought whole wheat(wheat berries) for making halwa, which till date I have never tried and it was lying untouched for a long time. On the day of his birthday, I was suppose to make moong dhal payasam. But when I was about to start cooking I just realized that there was no moong dhal at home. Oh No!! Such a carelessness. Then thought why not try with whole wheat and started browsing for recipes for "Wheat Payasam", I got all cracked wheat payasam. I wasn't even sure if they use whole wheat for payasam. But decided to give it a try and now am glad that I tried. It came out really creamy and delicious. Later I did feel guilty that I could not give this payasam to my son. He had just turned one and without consulting doctor didn't want to give him wheat (gluten). Also he may not be able to chew the wheat with his four bunny teeth. But saying his name, we thoroughly enjoyed this payasam. After making the payasam, later when I googled for whole wheat payasam I did find whole lot of recipes. Also recently Food network's Giada used this whole wheat in salad. Am planning to try that too sometime. 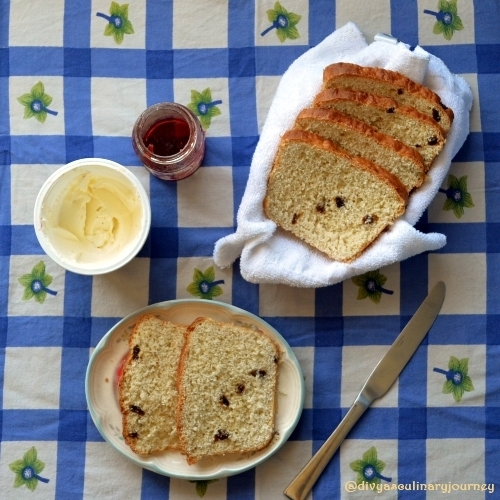 Coming to the recipe now . 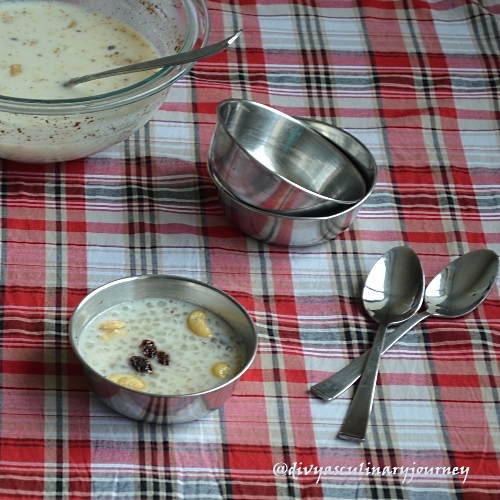 Whole wheat kheer/ Gothumai Payasam/ Wheat berry pudding. Pressure cook the whole wheat till its cooked. Melt the jaggery in a sauce pan with little water. This is done to remove the impurities. In a large sauce pan, add the cooked wheat and melted jaggery mix well, then add the coconut milk and simmer for 8- 10 minutes. Powder the cardamom with sugar. Add this to the simmering payasam. Then roast the cashew and raisins in ghee and add it the payasam and turn off the stove. The whole wheat is really tough to cook. So either pressure cook it for little longer time than usual or soak it but 2-3 hours before pressure cooking. Make sure that wheat is thoroughly cooked before adding to the jaggery, since later it doesn't cook except just absorbing the flavor. If you don't want to use the canned coconut milk, you can use 1 3/4 cup of fresh coconut milk too. 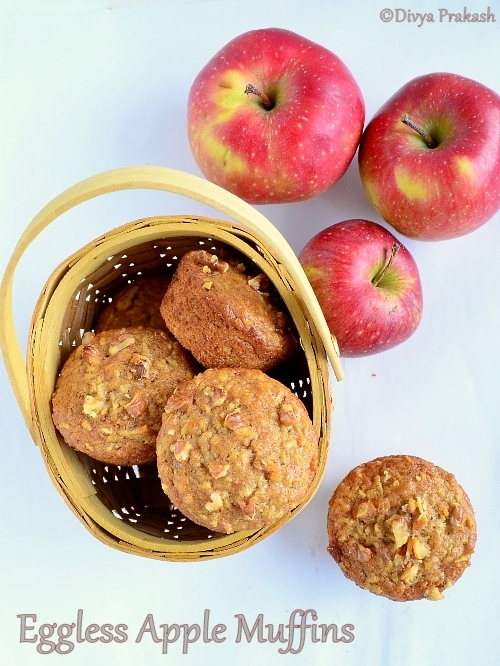 Today I am posting the recipe for Apple Muffins here. 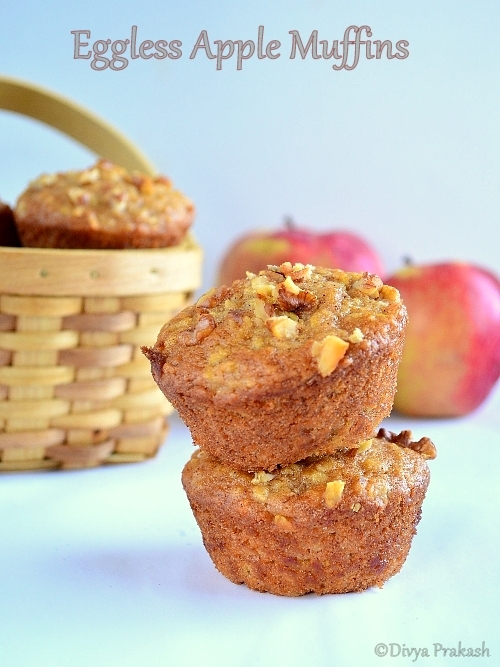 These apple muffins are soft and moist and does not require egg. These egg less apple muffins are easy to make and the recipe is fool proof for perfect muffins every time. 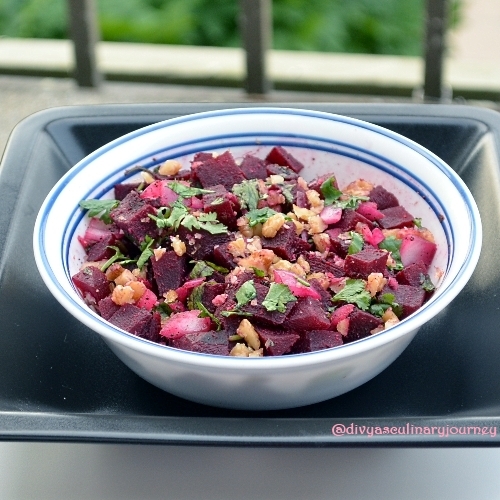 I have been wanting to post this recipe for quite sometime now. The reason is I didn't have a picture to go with the recipe. I usually bake in the evening,I don't take pictures then, since its dark and wait for morning and by then its all over, I don't get anything left for the picture. Whenever I bake them, the whole house smells cinnamon, drawing everyone to the kitchen. No wonder it gets finished so quickly. I am so proud to say that this recipe for Egg less apple muffins is mine. 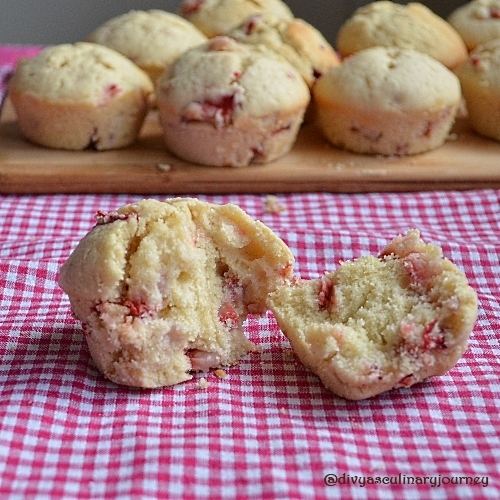 One crazy day I wanted to try an egg-less muffin, did so much experiments and after so many attempts have derived this recipe. But apple usually reminds of the fall season. 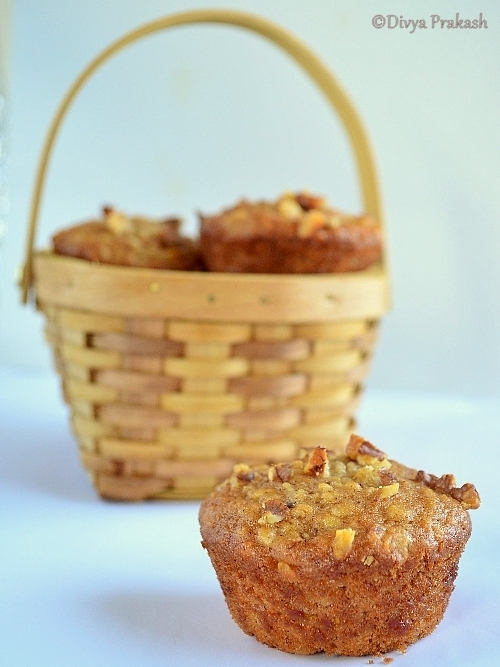 May be this apple muffin is an odd man out for this summer but totally yum anytime. Sift together Flour, Baking powder, Baking soda, cinnamon powder and salt. Set it aside. Mix yogurt and light brown sugar till it is dissolved. To this add oil,and vanilla extract and mix well. Then add this mixture to the flour mixture and mix till its blended well. Then add the grated apple and mix to form a homogeneous mixture . Pre-heat the oven to 350 F. Grease and flour the muffin pan and evenly divide the batter to 12 cups. ( I used ice cream scoop so that each cup gets the same amount of batter). Then sprinkle some walnuts and sugar on top of each one. Then bake for 15 minutes or till its done. To check insert a fork to the center of a muffin and it has to come out clean. I used Red delicious apple. Any red sweet apple will work for the recipe. I grated the apple with skin for texture. Before adding the grated apple, the batter will be thick. After mixing the grated apple, it will come to the correct consistency. While grating the apple, save the juice that comes out of it and add it to the batter. Also do not over mix the batter, it will yield a rubbery muffin. Also check the baking time in your oven. My oven took only 15 minutes. Some oven may take 20 minutes. You can use muffin liners too for easy clean up. Then skip the preparing process of the pan, use the liner and go ahead and bake. Every Week, the Sunday breakfast has always been Pancakes at home. 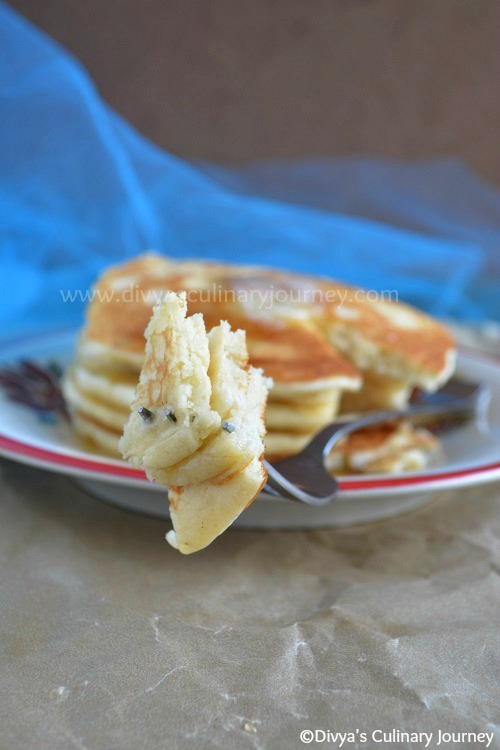 Though I make them very often have posted only one pancake (Blueberry pancake) recipe so far. So thought will post a basic pancake recipe today. This pancake is soft and fluffy and makes a hearty breakfast. 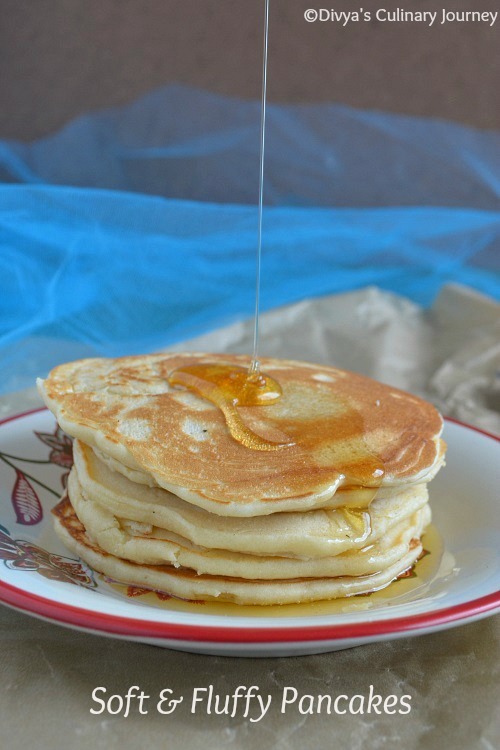 It is very easy to make and you will never use box mix for making pancakes again. In a large bowl,Sift together flour, baking powder, sugar and salt. Beat the egg, not too much, just till the yolk is mixed well and mix the milk, butter and vanilla extract and give a quick stir. Then pour this mixture to the flour mixture and mix till it forms a homogeneous mixture. Heat the griddle in medium high heat and grease it with butter. Then pour a ladle full of the pancake batter. Wait for 2-3 minutes when bubbles starts appearing on the surface then turn the pancakes and cook for another 1-2 minutes. 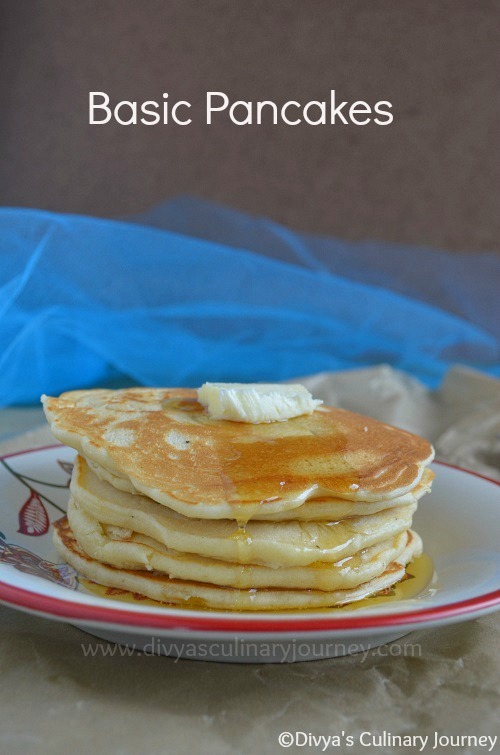 Remove from the griddle and stack them in a warm plate, drizzle some maple syrup and ready to serve. Ensure that milk and egg are in room temperature. Make sure not to over mix the batter, then pancake will become flat not fluffy. Every now and then grease the griddle with butter to ensure that pancakes don't stick to the griddle. Sometimes when the griddle gets too hot, sides will be burnt but still the pancake will be un-cooked, that time just reduce the heat. So that there will be even browning and proper cooking.